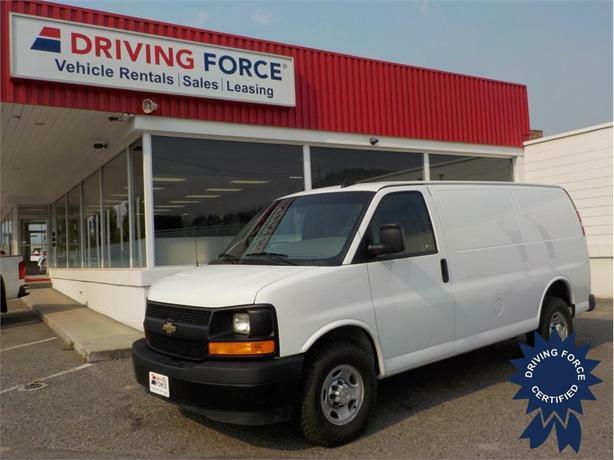 This 2017 Chevrolet Express 2500 Cargo Van comes with a 6-speed automatic heavy-duty electronically controlled transmission, 135-inch wheelbase, 3.42 rear axle ratio, front vinyl bucket seats, single-zone manual air-conditioning, AM/FM stereo with MP3 Player, driver and front passenger visors, Convenience Package including power windows and power door locks, Cold Climate Package including engine block heater, rear wheel drive, front independent suspension with coil springs and stabilizer bar, power steering, 117.3-litre fuel tank and Vortec 4.8-litre V8 gas engine providing 285 horsepower and 5400 RPM and 295 lb-ft of torque at 4600 RPM. The GVWR rating is 8,600 lbs (3,901 kgs). For more information about this vehicle, email us and one of our commercial cargo van experts will followup with you right away. Experience the difference you will only find at DRIVING FORCE Vehicle Rentals, Sales, and Leasing.